In a world where we’re increasingly working and leading across cultural differences, how can we leverage and be more inclusive of these differences? How can we encourage our teams to “be yourself” at work, yet expect them to adhere to workplace culture? The key is authentic leadership – and authenticity is the key ingredient for inclusion. 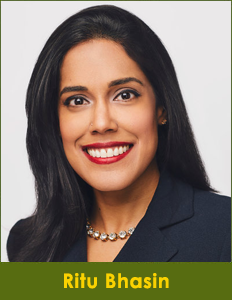 In this presentation, Ritu Bhasin, founder of bhasin consulting, inc, will uncover the profound connection between inclusion, leadership, and authenticity. She will also discuss the latest neuroscience, leadership, diversity, and mindfulness research related to authenticity, how to leverage the Three Selves – an innovative concept for being more authentic and adaptive, and how leaders can build stronger, more inclusive relationships by being more of themselves at work. After being highly successful in her early career, Ritu came to realize the person she was in her day-to-day life bore little resemblance to true self. So she decided to transform her life. She completed her MBA, left her corporate job, launched her own business, became a mindfulness practitioner and teacher, and dedicated her life to helping others become more empowered and inclusive. Through her work, Ritu is committed to disrupting the status quo to build a world in which each of us celebrates our own differences and the differences of others. She has delivered talks to thousands, inspired leaders to be more inclusive, and encouraged those who have experienced oppression to be more empowered. Ritu has won numerous awards for her work, including the City of Toronto’s William P. Hubbard Award for Race Relations.